An annual survey asks people about how inspired they are by the missions of big companies (Amazon, Facebook), nonprofits (the Red Cross, Doctors Without Borders), and even social movements like the Women’s March. What can we learn from their answers? 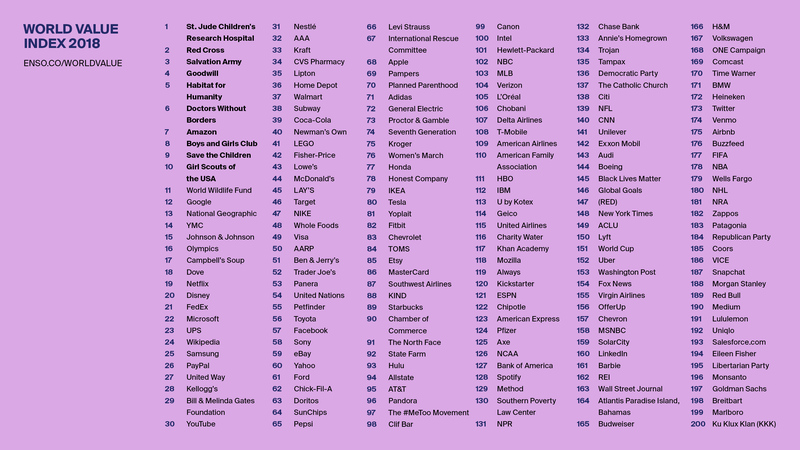 In the new ranking of American brands, St. Jude’s Children’s Hospital is first, and Apple is number 68. The #MeToo movement ranks higher than Chipotle. The Bill & Melinda Gates Foundation edges out YouTube. Enso, which first began the survey in 2016, realized that the ability to inspire consumers around a mission was a powerful tool, but one that wasn’t being measured in other rankings. Some of the results are unexpected. Amazon, for example, is the only for-profit brand in the top 10, even though those who study purpose-driven companies might not consider it one. The survey asked consumers how aware they were of a brand’s purpose or mission beyond making money, whether that purpose aligned with what they cared about, whether it’s a mission they would openly support, and whether the mission or purpose motivated them to buy products or services from the brand. Businesses have an opportunity to do better. While the majority of people say that businesses can be a force for positive social change, only a third trust business leaders to do what’s right. The survey also asked whether Americans felt that their employer’s values matched their own. Only 42% said that they did; only 14% said that they had a strong alignment of values with their employer. Some brands that are seen as more traditional–like Campbell’s Soup and Johnson & Johnson–have risen in this year’s list, something that Buck attributes to an increased desire to turn to brands that seem trustworthy in a time when only 27% of respondents said that they trust leaders in government. Nonprofits may also rank higher for this reason.